I first started photographing the blocks of Washington Boulevard between Pendleton and Walton on the northern edge of the Central West End in the early 1990's when I was in college. This lovely home at 4411 Washington, with its large octagonal tower stood out as one of many favorites in these fanciful blocks. 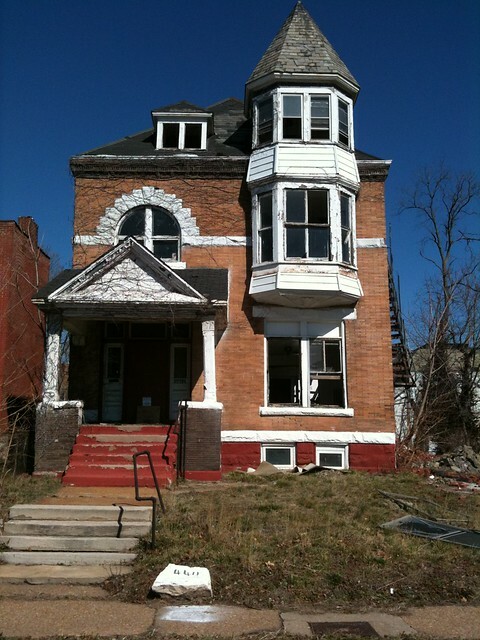 On a sunny day in July 2010, I revisited the 44xx block of Washington Blvd. to photograph several of the houses and noticed that 4411 near the eastern end of the cul-de-saced block near Newstead now appeared to be abandoned, with it's front door boarded and windows broken out. Detail of the pressed metal decoration at the bottom of the projecting tower. 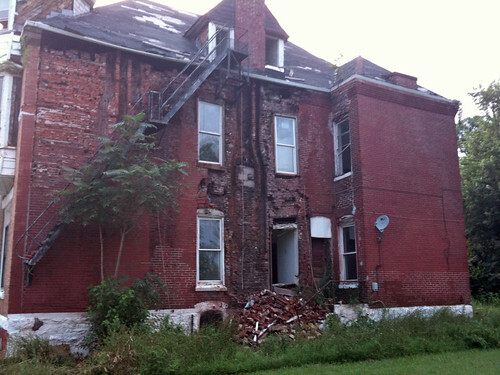 The east wall of the house had lost a good portion of its face brick. This was not the work of brick thieves as evidenced by the pile of brick below the center collapse, but rather water and freeze-thaw cycles. 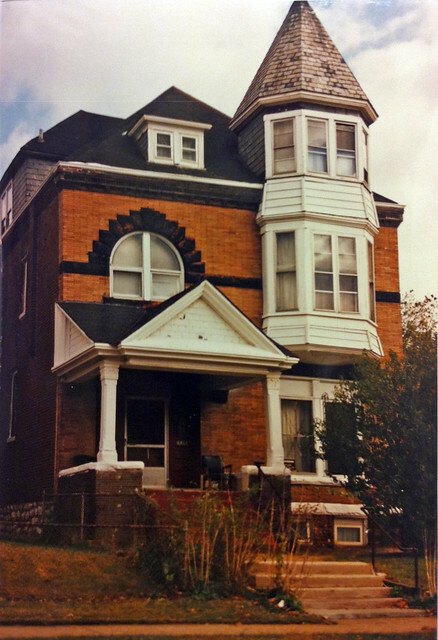 The sides and rear of the house had an unusual cornice made up of six courses of corbeled brick projecting out about eight inches at the top. The gutter, which sat on the top of the projecting ledge, which likely failed, sending water right into the middle of the wall. While this looks very bad, the house still had two intact wythes of brick supporting the floors and roof, and at this point was a very repairable issue. 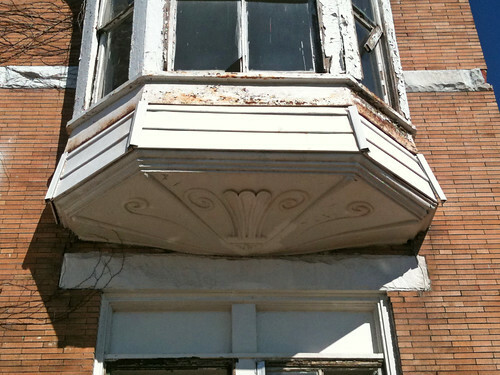 The home continued to sit unrepaired through two more winters. 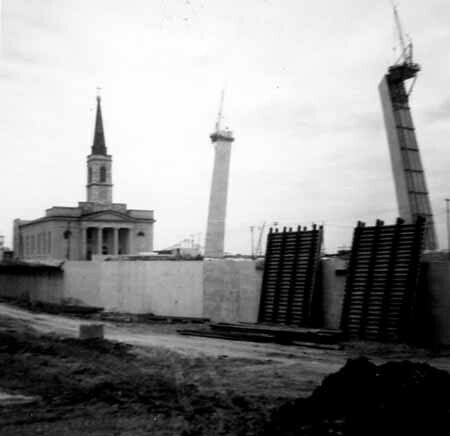 By early spring this year though, the weather had taken its tole and caused the total collapse of the center wall and chimney of the east facade. However even in this state the floors of the rooms abutting the opening were barely sagging. With proper shoring, which would simply involve building a temporary stud wall inside the opening, the home could have been easily stabilized for repair. 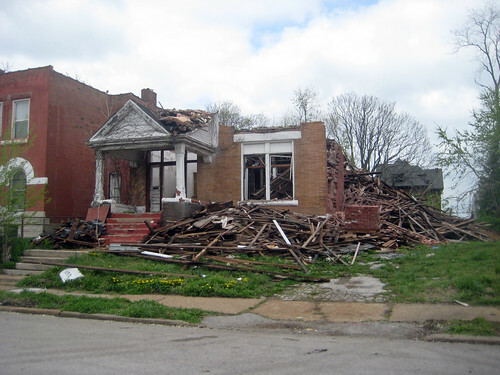 Not being included in the Central West End historic district though, there was little if any financial incentive for the costly undertaking of re-building the collapsed portion of the wall or going farther with a full rehab of the home. Above is a map of the east half of the Central West End Historic District. 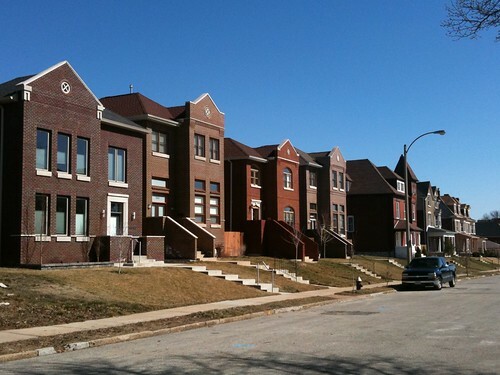 While the Central West End neighborhood extends up to Delmar, the historic district currently stops at the alley north of Olive, with Olive the dividing line between the 28th and 18th Wards. The area shades in blue was an expansion of the historic district that occurred in 2007. 18th Ward Alderman Terry Kennedy has in the past been against widespread expansion of historic districts in his ward because he thinks they promote gentrification. 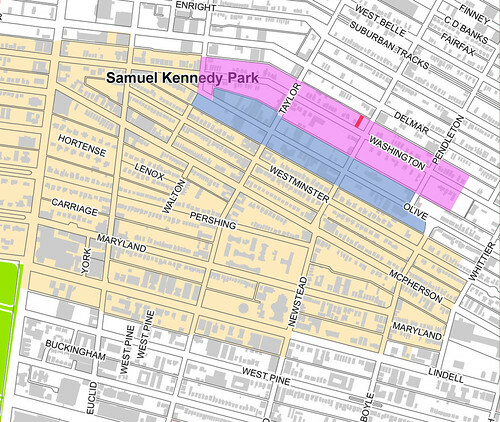 The area in shaded pink are blocks of Washington that would have been eligible for inclusion in the 2007 expansion of the CWE Historic District, but apparently Kennedy did not want it included. The parcel shaded red is 4411, which if it had been included in the historic district expansion would have been eligible for historic tax credits and would have had a greater chance of survival. Terry Kennedy is concerned with gentrification, yet the block of Washington just east of the demolition at 4411 has seen a group of very nice new homes built in the in the last years, which according to the City of St. Louis property records have sold in a range between $410,000 and $550,000! Not exactly starter homes, or homes that many long time residents would be able to afford. 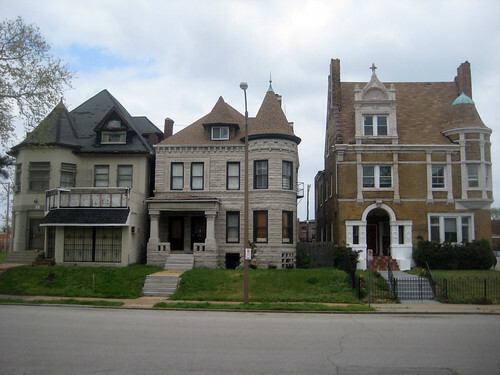 Three homes in the same block of 4411 show that the scale and character of the block is very much a part of the Central West End and very clearly eligible for inclusion in the historic district. Right across the street from the three above are 4474 and 4476 Washington, a pair of beautiful but forlorn twins that are abandoned. 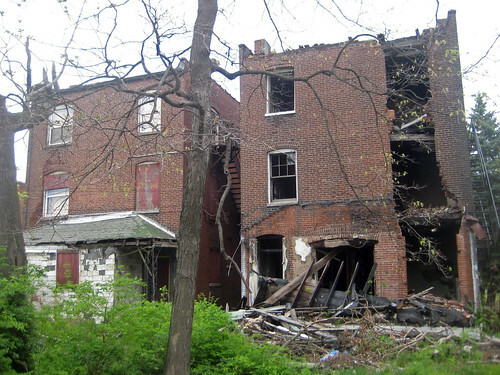 Availability of historic tax credits would greatly increase the chances that these homes have for survival. The photo below shows that 4474, which appears to have suffered a fire in a rear room, is in serious need of stabilization. 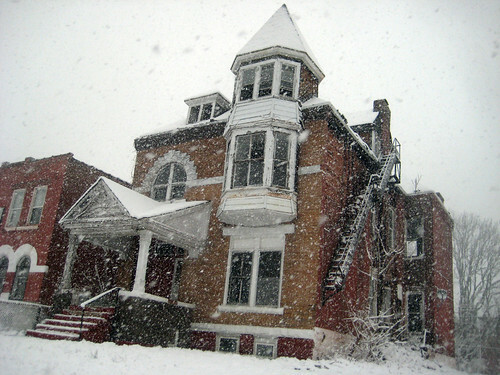 This beautiful home is still very savable, but with its condition and lack of financial incentive for its repair and renovation, I fear that it could end up the subject of a future post meeting the same fate as 4411 Washington. In case you missed MODOT's single two hour public meeting during the work day last week regarding "alternatives" to the lid concept between Downtown and the Arch, public comments can be made online through this Friday, April 20th. MODOT has a "virtual meeting" available with a brief description of the "alternatives" and a link to comment about them as well. Next STL also has a good synopsis of the options being considered. While MODOT is not currently considering the popular alternative to the "lid" of bringing what will no longer be part of I-70 up to grade as an urban boulevard as rendered above, that does not mean you should not comment about that concept. 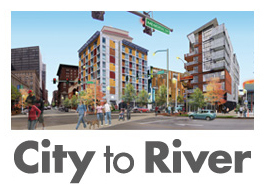 Why should you comment about a highway to boulevard concept between Downtown and the Arch? Because this is now going to be considered north of Washington Avenue. As part of a multi-modal access study for which St. Louis Development Corporation recently released an RFP, the elevated lanes between Washington and Cass will be considered for removal. 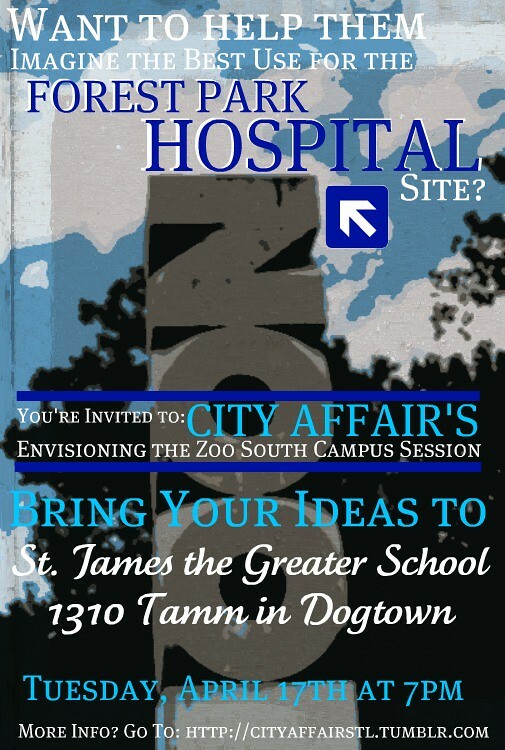 Next Tuesday, April 17th City Affair will be hosting a charrette style visioning session for the site of the former Forest Park (Deaconess) Hospital site at 7:00 pm at St. James the Greater School on Tamm. The St. Louis Zoo Foundation has announced plans to acquire the former hospital, demolish most of the structures, and develop most of the site for auxiliary use by the St. Louis Zoo. The currently proposed plan shows keeping only a 1982 black glass office building and a multi-level parking garage near Clayton Avenue. The rest of the site would be include expanded surface parking lots, suburban style landscape features, including a large reflecting pool, and a commercial development to be determined at the corner of Oakland and Hampton. 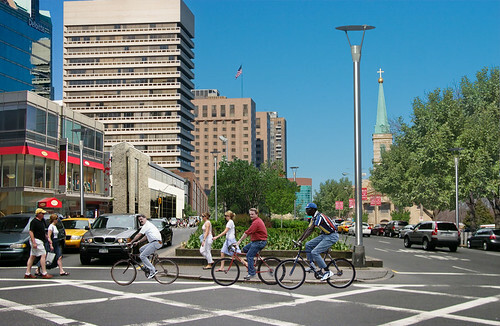 City Affair believes that the proposed concept lacks vision and use of good urban design principals for such a prominent site. The visioning session will allow participants to conceptualize what they would potentially like to see happen with the site, while also including the desired zoo program uses including off-site parking, office and research space. With 13.5 acres, there are many possibilities beyond parking and office/research space. 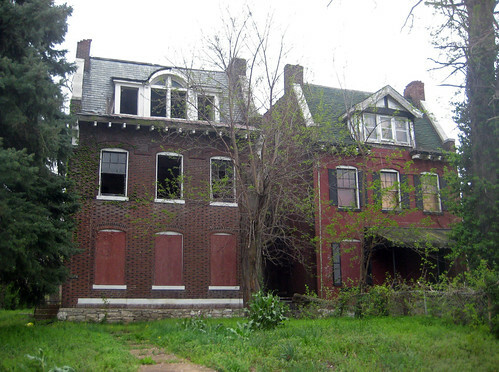 On March 26th, the St. Louis Preservation Board gave approval to demolish the hospital buildings. 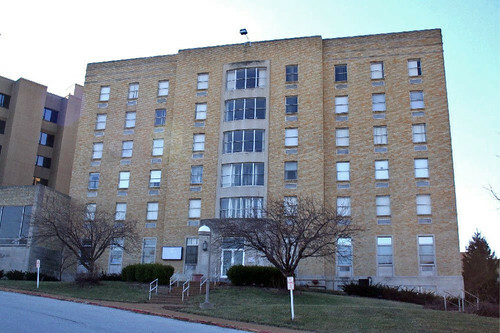 The Cultural Resources Office staff report indicated that the hospital complex is not eligible for listing on the National Register of Historic Places due to alterations that have been made to the main hospital building. Some however believe that it could be potentially possible to individually list some of the more prominent supporting buildings including the six story Sisters Home and the three story Gerhold Hall School of Nursing, both by Gray & Pauley, constructed in 1942. Saving additional buildings will not be a requirement at the visioning session, but could be part of concepts for the sites reuse. Additional background information can be found on City Affair's website. Please RSVP for the visioning session on the event Facebook page. The resulting concepts created at the visioning session will be entered into What Should Be's call for submissions, which has a deadline of April 27. At the Preservation Board meeting last month, zoo representatives admitted that the plan currently being shown is simply a place holder and that they will be seeking additional input for the sites eventual reuse. This afternoon MODOT will be holding a public meeting for people to look at "alternatives" for the proposed lid over I-70 to the Arch grounds. The meeting will be held at St. Louis City Hall at 1200 Market Street from 3:00-5:00 pm (real convenient for people who work during the day!) in the Board of Aldermen board room on the 2nd floor. This dog & pony show is to fulfill MODOT's federally mandated requirement to seek "input" from the public regarding changes being made to the section of highway between Downtown St. Louis and the Jefferson National Expansion Memorial (Arch grounds). NPR reported yesterday morning that MODOT will not consider the popular idea of removing the highway and installing an at-grade boulevard between Downtown and the Arch grounds because they are concerned about traffic (although it has never been fully studied) and such a project could not be completed by the artificially mandated "deadline" of October 28, 2015, which is the 50th anniversary of the completion of the Arch. This date is fairly meaningless when you consider that the park surrounding the Arch was not completed for over a decade after the completion of the Arch. Recently however, it was announced that a traffic study will be done for removal of the elevated highway section between Washington and Cass Avenue. 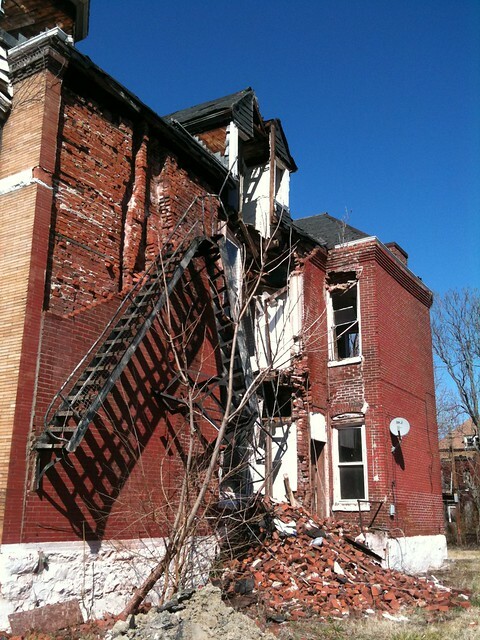 St. Louis Public Schools will lose around $1.6 million dollars by demolishing the old Hodgen School! Landmarks Association has obtained information showing that the combined environmental abatement and demolition will cost $774,297. 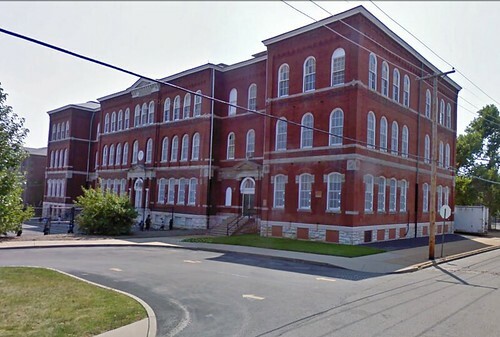 Hilliker Corporation, who for several years has been the listing agent for surplus schools for sale currently has 4 other former SLPS elementary schools listed on their school properties page ranging from $19.03 to $20.57 per square foot. At $19.00 per square foot, the old Hodgen School would list for $874,000 if it was for sale instead of being demolished. 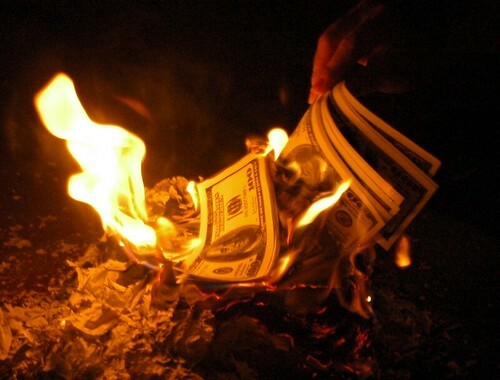 The combined loss of our tax dollars for the demolition and loss of sale revenue totals $1.65 million! SLPS formerly had the Hodgen School for sale and in 2008 according to the Business Journal it was under contract, but since that time, apparently SLPS has decided it has money to burn.